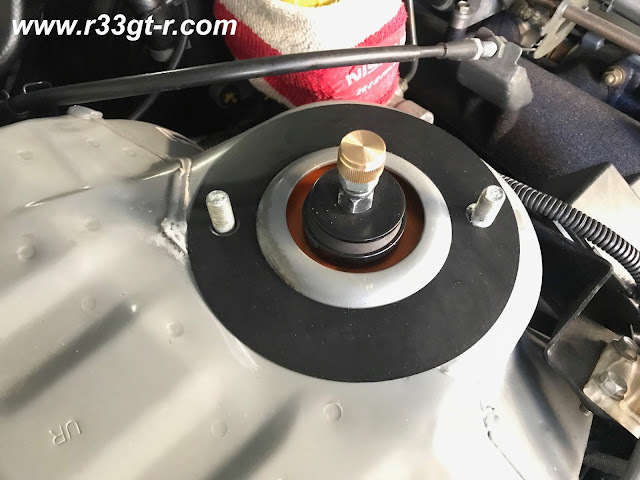 One Man's Lonely Adventures In His R33 Skyline GT-R: First Mod of the Year - Super Easy! First Mod of the Year - Super Easy! Welcome to 2019 - and yes it's already one month old! Here in Japan it's been cold which is always an excuse for me to not work on the car. Luckily, the first mod of the year was a super easy one, thanks to my misguided 34 owner friend Ale who kindly came over to drop it off. I have no idea whether what he told me is true (you know those Italians), but he told me "this is a NISMO item that's not even in their catalog." Duly curious, I popped open the hood and waited to be surprised. 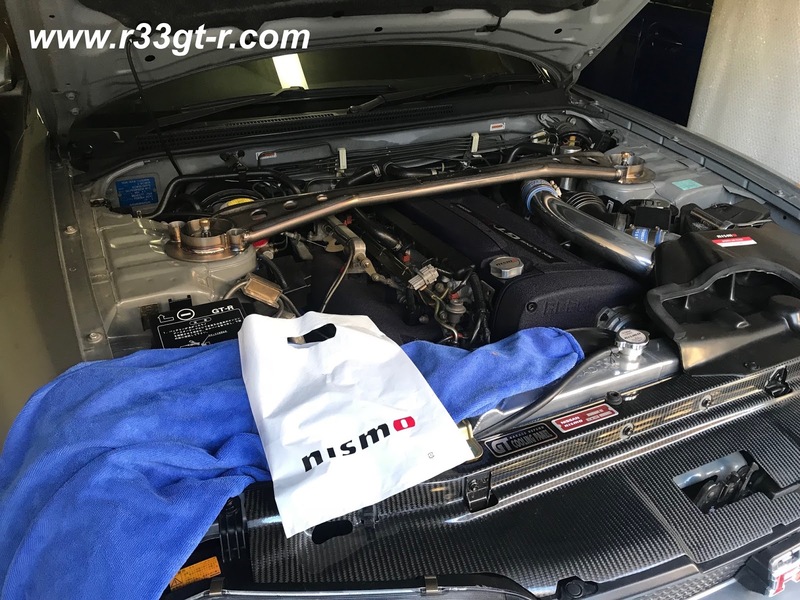 What does the nice NISMO bag contain? What's this? 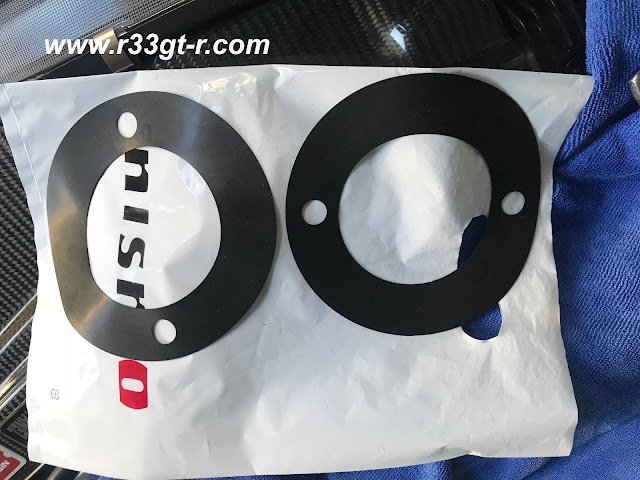 Large thin rubber rings with holes in them. It turns out that Nismo Omori Factory uses these to prevent galvanic corrosion between their titanium tower bar and the steel body chassis mount point. Of course, I beat them to this idea, because about five years ago I found a tower bar modified with rubber strips on Yahoo Auctions, for the same reason. But because I don't cut rubber strips well, I went with another route. Anyway, installation is super easy - just take off your tower bar, make sure the surface is clean, and then place over the strut tower bolts. Here is Ale showing us how to do so, singlehandedly! Being NISMO, of course it fits perfectly. After that, just bolt up the tower bar again and you are done! Maybe 3 minutes from start to finish. Don't forget to use a torque wrench to properly torque up those bolts! (39.3-53.9 N-m or 4-5.5kg-m). Anyway, the following months of 2019 promise some interesting mods I have planned. For one, it's been over 11 years (!!) since I got the Mine's build engine installed - maybe it's time to tinker with it or improve it? My car still shows some other problems from the horrible, crap work done at Worx Autoalarm and so I really want to finish fixing all of those issues as well. So let's hope 2019 is a great year for all of us! And thanks to Ale from taking time to stop by and drop off these parts! I too have home made rubber mounts on my Kansai struct brace. It's the kind of thing that you would think all (reputable) makers of strut braces would send out with them! Confirmed. 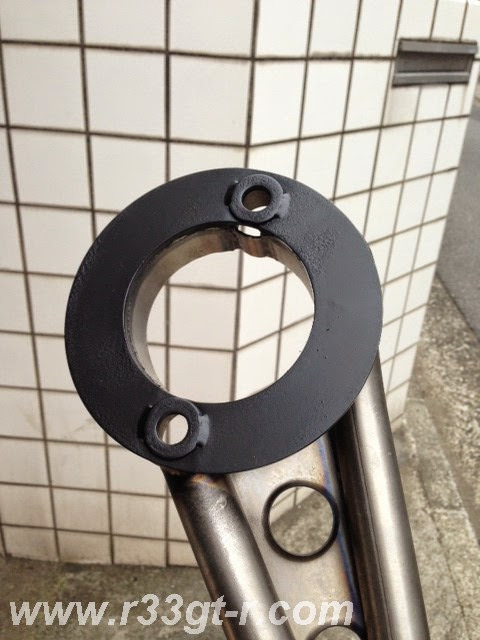 Recently bought the new 400r tower bar from omori, I was about to install it and saw this post. Went back to Omori and showed them the picture of the rubber rings and they do sell them for about 600 yen each. Karl - good to hear from you. And yes well since they are cheap to make would not be surprised if this became a standard item!